I can better appreciate how Huck Finn felt after a recent day where I spent a few hours fishing our own White River. For sure the White is not the “Mighty Mississip”… but when you are used to walking small streams it may as well have been. I still remember watching the old black and white movie of Huck and Jim floating down the great river and something inside has always wanted to give this a try? 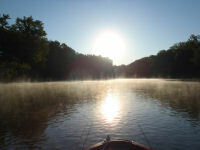 I put in just south of the new bridge into Spencer and had fishing on my mind as I was up early in search of smallmouth bass. Now…before we get to far, let me admit that I got skunked and I don’t get skunked very often. I really thought this would be a good time to find a few smallies as the river was so far down that it would both reduce the area to search and hopefully clear up the water. As it turned out it didn’t matter as I threw my best, and usually great, baitfish and crayfish patterns and came up empty handed. No problem though…as the morning progressed not catching fish wasn’t a big deal; I found that the river was in prime condition and on this morning it was truly a beauty. As I said the water on the river was way down….I am not a river expert but I am not sure how much lower the river can or will get…but it was low enough that I had to stop my outboard engine twice and use my trolling motors on my new boat to negotiate a path up the river. I am sure that the right person who knows the path of the river channel could do a better job of following its deeper water, but for me I did my best and for the most part was able to run along, unimpeded by the bottom for quite a long ways. I put in just after sun up and it was neat to pass under highway 46 and hear the sounds of the many cars and trucks on their way to work…knowing that I had the day to enjoy nature and all it had to offer. As I neared the first bend in the river…a subtle sweep to the right, the sun was topping the trees and the scene in front of me was magical. Steam or fog from the warm river water was cascading upwards and being circulated in a cylindrical fashion making for hundreds of small tornadoes rising some twenty feet into the air. I have seen this phenomenon before but never in such perfect light and it set the mood for the day. I pushed on, moving upstream and quickly neared the edge of McCormick’s Creek State Park. Many times the boys and I have walked trail 7 down to the edge of the river; if you are in search of a nice walk then give this trail a trial….you will be pleased with the walk and the view. In a few more river minutes I neared the area that I usually pull in and stop; just short of the riffles in the river and it was obvious to me that I wasn’t going any further, at least no further without some Lewis and Clark pulling and tugging of my little boat. I propped the outboard up and started my way back down river. I had on a large shiner pattern and was using my 6 weight sinking line. I made casts around and through downed limbs and over rocks, etc…and while I had a few strikes, as I said, I didn’t hook a fish. For me the most intriguing portion of the trip came as I started to float or dead drift back down the river. Except for an occasional whine of a big truck from highway 67 north of Spencer….there was no human noise, just me and nature. I watched as an immature bald eagle flew smack dab down the middle of the river and then disappeared into the trees. I had a pair of herons that were busy with their day, squawking at each other like an old married couple that I know so well! Mostly I took some time to just sit, listen and enjoy the serenity of this beautiful southern Indiana day. I knew that the next few days were supposed to be near or over 100 degrees and the cool breeze I was enjoying would soon be moving north. If you are, like me, a water person…then right now might be the right time to put in on the White and spend a day getting close to nature. The water is certainly down and would make a great time to give your canoe or kayak a try…for sure your efforts will be rewarded as you draw closer to a natural high that is just waiting for you around the corner. I hope you give it a try and put on your best “Huck Finn” as we all Enjoy the Great Outdoors.